The largest crowd the Urban Development Institute has ever seen at a luncheon turned out Jan. 25 to hear Andrew Ramlo discuss the future of development in the Okanagan Valley. Ramlo, the vice president of market intelligence at Rennie Group, gave a presentation jam-packed with information, laying out in detail many of the factors driving change in the region’s housing market. He pointed out that the region has shown a strong economy and population growth in the recent past, as home prices have increased significantly. But it was the analyst’s predictions for the future that piqued the most interest. Taking a look at the 10-year historical averages, Ramlo pointed out that the region has added about 1,650 new homes a year. That means the 3,500-plus that were started in 2017 is about 120 per cent higher than usual. Ramlo said completions in the region followed a similar trend this year, with 2,439 homes finished by the end of 2017. That is also significantly higher than the long-term average of 1,549. It was using those numbers that Ramlo was able to calculate what the future might hold for the region’s housing market. 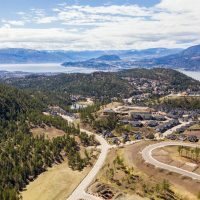 Ramlo pointed out that, thanks largely to migration into the region, the Okanagan is set to grow to about 276,000 people by 2036. That’s about 78,000 new people coming into the region, and Ramlo said those people will require about 38,000 new homes to live in. “We should see about 2,000 units be demanded on average, yearly, on the short term That falls way below the 3,000-plus completions we’re going to see,” he said. And while the supply looks like it will outpace demand in the near future, Ramlo said that doesn’t mean disaster. “You always want starts to be above occupancy demand,” he said. Part of that will be because some homes will just need to be upgraded, meaning about 2.5 per cent of starts each year will fall into the “replacement demand” category. 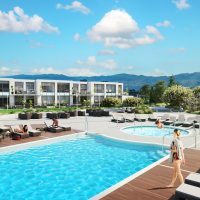 The Okanagan also has a significant market for recreational homes. When they get build they are added to housing starts data, but aren’t calculated into occupancy demand because they’re not full-time housing. Ramlo also said part of the recent inventory boom is also developers simply filling a pent-up demand.